The White Church Bird House with red doors and black roof has a small town charm. The White Church Birdhouse an authentic look and gives the birds a nice place to setup for their young hatchlings. It has easy access to clean out to get ready for new nest builders. 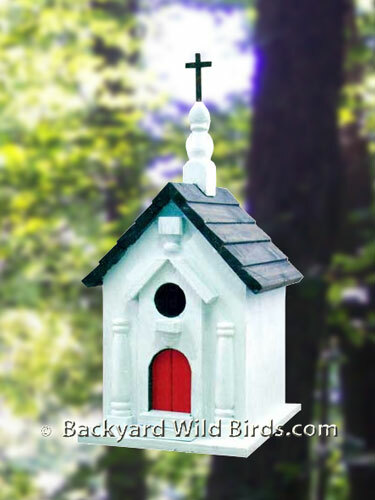 This decorative bird house is made from wood and is painted to match a small town church. It is definitely wholly with the a 1.5 inch size hole for Wrens and other birds like swallows, titmice, etc. 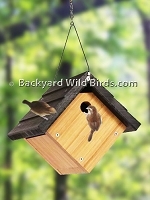 This bird house is a great sanctuary for your feathered friends. This is just the Bird House that your Wrens have been praying for!